MUMBAI, India (AP) The India selectors have stuck with a winning combination, retaining the 16-man squad from the test victory over Bangladesh for the first two tests against Australia. India beat Bangladesh by 208 runs in a one-off test on Monday, following home series wins over England and New Zealand, and will start the four-match series against Australia as hot favorite. Virat Kohli’s squad is on a 19-test unbeaten streak, and has been unbeatable on home soil in its last 20 tests, winning 17 and drawing three. Australia holds the Border-Gavaskar Trophy after winning the four-match series 2-0 in Australia in 2014-15, but was swept 4-0 in the previous tour to India and has lost its last nine test matches in Asia. Australia will play a warmup against an Indian XI this week, and the first test starts on Feb. 23 in Pune. 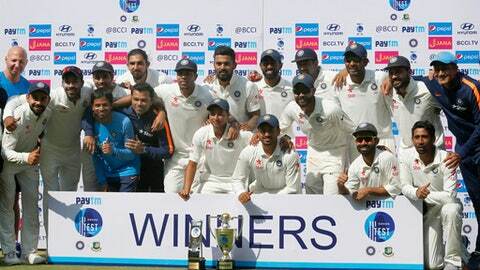 India: Virat Kohli (captain), Murali Vijay, Lokesh Rahul, Cheteshwar Pujara, Ajinkya Rahane, Wriddhiman Saha, Ravi Ashwin, Ravindra Jadeja, Ishant Sharma, Bhuvneshwar Kumar, Umesh Yadav, Karun Nair, Jayant Yadav, Kuldeep Yadav, Abhinav Mukund, Hardik Pandya.